*Expected as a future upgrade. ** Recording onto the optional AXS-R5 recorder. The F55’s Sony 4K image sensor incorporates a revolutionary electronic global shutter to eliminate rolling shutter distortions. With 11.6 megapixels (total) and 8.9 megapixels (effective), the Sony 4K CMOS sensor captures a true 4K 4096 x 2160 DCI-standard cinema image. The F55 features high-data-rate on-board XAVC HD recordings up to 60 fps, plus a free planned upgrade to XAVC 4K, QFHD and 2Kup to 60 fps and XAVC 2K/HD up to180 fps. It also offers 240 fps 2K RAW with the optional AXS-R5 outboard recorder and a planned upgrade, achieving the highest frame rates most productions will need, while retaining exceptional, 16-bit image quality. Sony provides a coordinated “off-line, on-line” workflow with simultaneous recording to internal SxS cards and the optional AXS-R5 RAW recorder. For seamless conforming in post, you get matching time code, start frame, stop frame, file names and other metadata. The camera supports the following RAW + On-board combinations: RAW 4K/2K + XAVC 2K*/HD, RAW 4K/2K + MPEG-2 HD422 and RAW 2K + XAVC QFHD*/4K. The F55 is designed to accommodate PL-mount, FZ-mount and still lenses. With the PL-mount adaptor, you can take advantage of acclaimed cine optics from Angénieux®, Canon, Carl Zeiss, Cooke, FUJIFILM, Leica and more. Slip off the supplied PL-mount adaptor to reveal the native FZ mount with 18 mm flange focal distance. It’s perfect for accepting commercially available adaptors for still lenses, including Canon EF, Canon FD, Nikon DX, Nikon G, Leica M and even 2/3-inch broadcast B4 lenses. There’s also Sony’s game-changing FZ-mount auto focus servo zoom: the SCL-Z18X140. 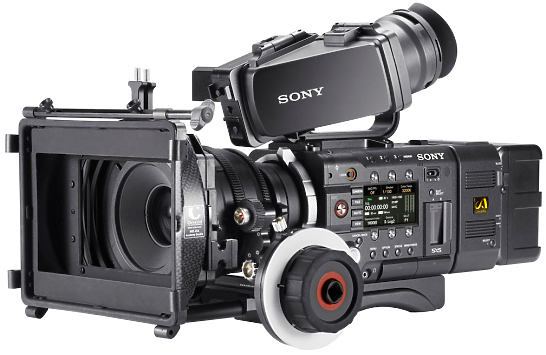 The F55 works with Sony’s second generation, cost-effective PL mount prime lenses. Thanks to refined glass, all are certified for 4K capture, while minimizing geometric distortion, vignetting and breathing. A 9-blade iris delivers beautiful bokehs. The focus rings rotate 240°. The series includes focal lengths of 20, 25, 35, 50, 85 and 135 mm. For easy lens changes, all have the same T2.0 aperture, the same external diameter, matte box diameter, and gear locations for follow focus and aperture. All are the same size except for the 135 mm. Carefully designed with significant input from cinematographers, the F55 provides an incredibly rich range of controls. And the interface is nicely intuitive. Instead of diving through menus, you get direct, one-touch access to key shooting parameters including frame rate, shutter speed, colour temperature, ISO sensitivity and gamma. Assignable buttons mean that favourite adjustments are always at your fingertips. The camera offers powerful connections, including real-time 4K output to a compatible monitor. It is made possible by four 3G-SDI outputs. There is also HDMI, USB, DC in connection, a removable XLR audio module and a removable time code/genlock module. The XLR inputs accept balanced analogue signals, provide 48-Volt phantom power and will accept four channels of AES/EBU digital audio with an expected firmware upgrade. The F55 takes advantage of Sony’s innovative BP-FL75 battery pack, which uses Olivine – Lithium Iron Phosphate – instead of conventional Lithium Ion cathodes. The result is a substantial increase in charge-discharge cycles, compared to previous Sony batteries. The Olivine battery works with Sony’s BC-L90 quick charger. The camera is also compatible with Sony’s BP-GL95A, GL65A, L80S and L60S batteries, which use the BC-L70 and L160 chargers. The traditional CMOS image sensor uses a 'rolling' shutter that can result in images with unwanted distortions like motion skew and flash banding. That can be annoying, especially when shooting visual effects or 3D. Anything but typical, the F55 incorporates electronic global shutter. Rolling shutter distortions aren't minimised, they're completely eliminated. 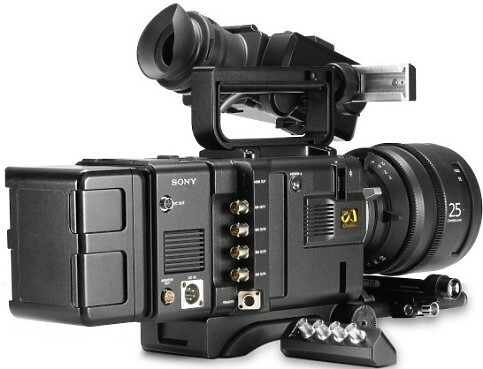 Hire the Sony F55 Super 35mm 4K from Procam. Best service and rental rates for the Sony F55 Super 35mm 4K and all cameras, lenses, sound, lighting and grip.